Estimated 2-5 Business Days with UPS Ground. Lithium Batteries are only charged to 30% of capacity. When you receive this battery it may need to be charged. This is the battery charger we recommend for this battery: OptiMATE Lithium TM-471. 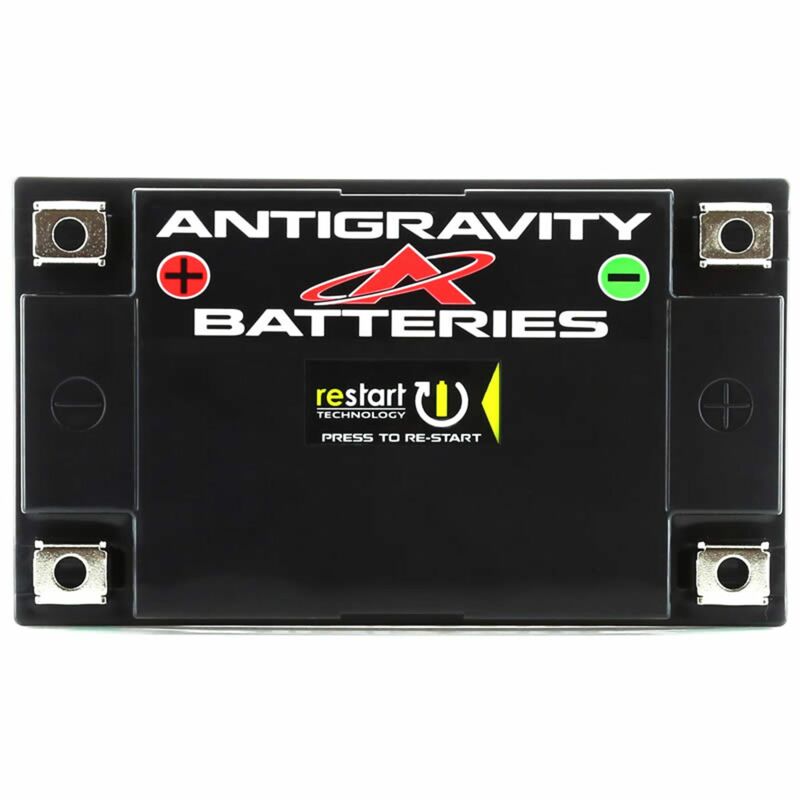 The NEW Antigravity ATZ7-RS battery is built with Antigravity's groundbreaking RESTART Technology (built-in jump-starting) so you won’t ever get stranded with a dead battery again! 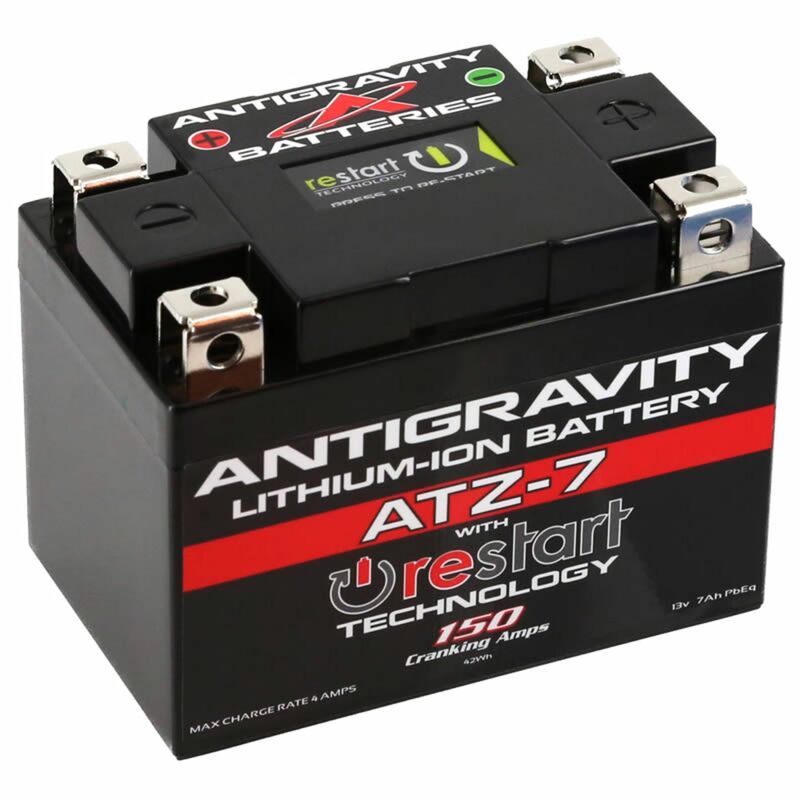 The ATZ7-RS is a hi-power, lightweight Lithium-Ion battery that directly replaces the OEM Lead/Acid YTZ5S, YTZ7S, YTZ8V, YTX4L, YTX5L, and the YTX7L-BS. The revolutionary ATZ7-RS RE-START Battery intelligently monitors its status, and just before going completely dead puts itself to sleep with just enough energy to get your vehicle started again. Simply press the RE-START button located on the battery, start your vehicle and drive away… No more dead battery emergencies or being stranded! FULL Battery Management System (BMS) including Over-Discharge, Over-Charge***, Thermal Protections and Cell Balancing. Per Antigravity Inc.: *** If you own an older classic bike from mid 1980s and earlier you must update the charging system to a modern solid-state voltage regulator. Damaged or excessively old voltage regulators can over-charge and damage lithium batteries and cause smoking and melting of battery. This is NOT a fault of the battery! Do you own the AG-ATZ7-RS? Please, tell us what you think about it. It helps us provide you with better products. Please note that it may take up to 72 hours for your review to appear.